It’s snowing in Vermont on Boxing Day, which we don’t actually celebrate the way the British do. 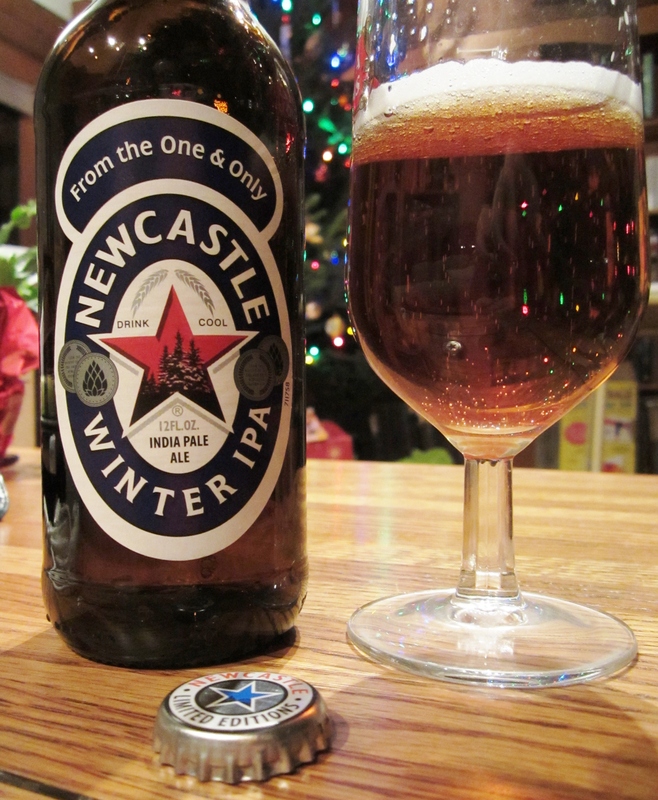 But we could certainly have an English Winter Ale by way of acknowledgement to our cousins across the pond. To this end the makers of Newcastle Brown have obliged. A limited edition beer that was distributed in limited fashion last year, this year’s vintage went nationwide last month, much the way previous Newcastle seasonal releases have—Summer Ale, Werewolf and Founders’ Ale. I wasn’t bedazzled by the Founders’ Ale when I tried it this spring. It was, as I said, certainly drinkable, but didn’t appear to be aiming very high. But I also traced the history of Newcastle ownership through the hands of Caledonian, Scottish & Newcastle, and now Heineken UK. One would expect the company to be aiming at the widest spectrum of beer drinkers (and it is reasonably priced accordingly), and that most offerings would receive a tepid response from beer geeks. At best. It’s decidedly not a west-coast style hop bomb that many younger American drinkers have come to expect and demand from their IPAs. And at 5.2% ABV it’s almost a session beer here these days. So while this one turned out pretty much as I expected, I found it much more ingratiating than the Founders’ Ale. And my son, Mike, who’s pretty much a mainstream drinker, liked it far more than last night’s Delirium Tremens. It’s a copper brown beer with toffee and honey notes in the nose, a sweet caramel follow-through in the palate and hearty enough mouthfeel. “It’s very filling,” said Mike. But there’s an effervescently tart finish, the hopping with Super Styrian and Styrian Goldings hops. My sample vanished far too quickly. I would think the Downstairs folks might be pleased to receive some of the Winter IPA from the Upstairs folks, if that is indeed the origin of the Boxing Day tradition. Since servants frequently worked on Christmas Day, they frequently took December 26 off, receiving Christmas gift boxes from the lords and ladies of the manor. Fans of “Downton Abbey” may know about this better than I. But December 26 is also St. Stephen’s Day, frequently when church poor boxes are opened up and distributed to the needy. Either way, it’s a legal holiday in England, and the stores are packed. The Christmas connection works out nicely, since “Good King Wenceslas” is one of my favorite carols, and in it the good king is looking out (presumably of the royal window) “on the Feast of Stephen” or December 26. And he then heads out into the harsh winter weather to distribute alms. At the moment, it’s looking pretty harsh here out of our royal window. But if the weather reports are to believed, by tomorrow morning there should be plenty of snow laying round about, deep and crisp and even. Luckily, we have more beers on hand.